Back in the day...before television networks dictated college football schedules and kickoff times, Michigan could normally be expected to kickoff around 1 o'clock on any given Saturday...with the Ohio State noon kickoff time being the usual exception. During the Bo era, this was typically the case. Which is how he preferred it. 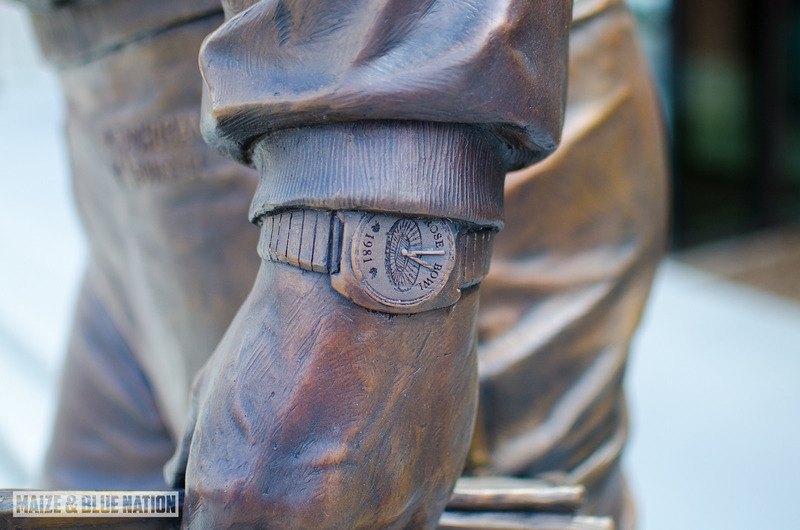 So much so that on the statue of Bo outside of the building that's named after him, his 1981 Rose Bowl watch set to 1:00 on the dot (see image above). This was not a coincidence. In Michigan's 1981 season, for example, every home game began at either 12:00, 1:00 or 1:30. Same went for pretty much every year until 1987 when Michigan opened the season hosting Notre Dame at 3:30...on ABC of course. 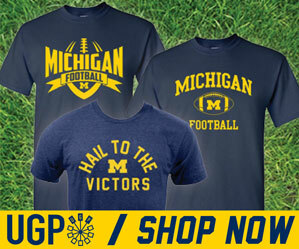 By and large, for the better part of Bo's tenure Michigan, games kicked off in the early afternoon. This was just the way he wanted it. And back then TV networks obliged. But as college football started to grow in popularity, and the television audiences reflected that, TV gained more authority over times and schedules. By the late 80's/early 90's, most of Michigan's high profile home games (and there were many of them) were always picked for the more television-friendly 3:30 or later afternoon time slot. For the most part, this practice has not changed to this day. There's a whole long story about the SEC and Big East and how they defected from the now-defunct CFA (College Football Association) to sign a deal with CBS in 1995. Notre Dame signed with NBC, and the Big Ten aligned with ABC/ESPN for television rights. This didn't change kickoff times, per se, but it certainly led to the networks having more influence overall. These days, high-profile prime time games are all the rage among television networks. Simply put, night games are just better for TV. Michigan remains a proverbial small player in the arena of playing host to prime time audiences, having done so only 3 times in their 137-year history...while conference foes like Ohio State, Penn State, Rutgers and Iowa may host that many night games in a single season. For the most part nowadays, Michigan home games start at their 12:00, 3:30 or 8:00. Each has their own pros or cons for various reasons. We ran a Twitter poll last week and asked people which was their preferred kickoff time. The results were unsurprisingly mixed. Which is your preferred Michigan Football kickoff time? Noon and 3:30 times flipped the top spot multiple times during the 24-hour poll window with 3:30 edging out the narrow victory. The consensus was that older people preferred nooners, while younger fans prefer afternooners. There were exceptions, but this seemed to be the norm. Prime time games, while fun for some, were never in contention in this poll. Gets the game started early so it can finish early. Fans at the game can generally get home in time to see the 2nd half of the 3:30 games on TV. Or, it leaves plenty of time during daylight hours for after-game celebratory tailgates...which hopefully will remain a more common occurrence these days. If you're watching at home, it's nice to get the game over and done with by 3-ish so there's time left to get things done around the house before it gets dark out. From a media perspective, I have to say noon games are generally more preferred due to the amount of work that needs to be done once the game ends. Stories need to be written and filed, TV crews are wrapping up, photos need to be downloaded/sorted/uploaded and none of that can happen until well after the coaches shake hands at midfield. If it's at noon, it's probably a bad opponent. Let's just be honest. The exception being Ohio State, of course. Noon games are also tough for students.. It's early. Fans in general seem to be a little less enthusiastic for noon games. You're never going to get that pumped up to play Central Michigan. Noon games also make for earlier mornings/less tailgating time for folks going to the game. There tends to be a "let's just get the win and go home" approach to a noon game sometimes. It stinks because we wait all year for Michigan football games, but it's just the way it is. If it's an afternoon game, odds are it's a pretty decent opponent. That right there is enough to make the general stadium atmosphere more electric. Fans are more into the game, students have plenty of time to show up, everyone just feels little more into it. Plus, if it's a late October/November game, the 2nd half will be basically a night game...which adds another layer of excitement to the festivities. If you're watching at home, it's almost ideal...giving you ample time to get done whatever you got to get done during the morning/afternoon and you're good to go in time for the game. If you have small kids in sports, this is your jam. Afternoon tilts allow for plenty of tailgating time...sometimes too much :) You don't have to rush around in the morning (if you're coming from nearby) and parking/traffic can be hassle-free if you do get a jump start before the masses descend on the usual parking hot spots. You're whole day is spent. Which, for some, is not a bad thing. But for others, weekends are precious. And by late September, after 4 or sometimes 5 straight weeks of home games...it can be a grind. If the opponent is good, traffic and parking can get chaotic, especially if the golf course and/or Pioneer HS are closed due to weather. Media folk tend to not like 3:30 games for reasons already mentioned. It just makes an already long day three and half hours longer. And if it's a good opponent in a close game, no one starts writing their stories until the game ends. This might not make any sense to the casual fan, but for media people, the struggle is real. Well, this is easy. If it's under the lights, it's a big game. Michigan has only hosted three in it's history, two versus Notre Dame (2011, 2013) and one versus Penn State (2014), so we're still in that this is special honeymoon phase. All three netted big victories and the atmosphere was exceptionally electric. The pregame hype for the first UTL game in 2011 against Notre Dame was like something I've never witnessed before. It was still Michigan Stadium, but it felt completely different from a noon or even afternoon game. That stadium, at night, is a sight to behold. It's just crazy. Plain and simple. The product of having an atmosphere like that is that it puts stress on everything else. Traffic and parking is nuts...pre and post-game. The stadium is packed even tighter than normal. Security is heightened, thus lines are longer, causing delays. It's like a normal gameday on steroids. For us media people, I know...poor us, it's a very late night. As in we're not leaving the stadium until wee hours of the morning. Night games are great for TV, students and season ticket holders looking to get back some of their investment if you know what I mean. But they're not so great for the general fan who just wants to enjoy a game like they would normally do. I think most everyone is fine with a healthy mix of kickoff times on the schedule each year. Ideally, as long as the opponents are good (especially the non-conference foes) and Michigan wins, it's all good. Of UM's 4 road games this year, Iowa and Rutgers are night games, Ohio State will be at noon and it's likely Michigan State will be a 3:30 game...I'm just guessing. Michigan has always been good for TV ratings. Adding Jim Harbaugh to that equation only increases the demand for Michigan to be featured in front of a national audience. Late afternoon and prime time games are only going to become more frequent as major college football continues it's shift to later in the day kickoffs.